This high quality stainless steel stackable container with three separate compartments from Clean Planetware is a great gift in itself. With the handle on top it makes a perfect lunch tote (they use these in India as delivery containers) or it makes a great storage container since all the compartments are airtight. 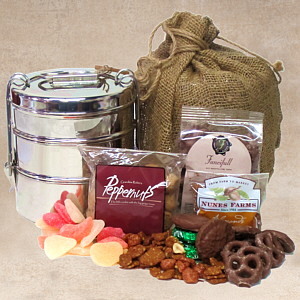 It is filled with an assortment of treats including: Peppernut Spice Cookies, Chocolate Pretzels, Chocolate Filled Peppermint Drops,Roasted and Salted Jumbo Corn and Nunes Almonds. We wrap it in the burlap sack which makes this delicious and green - no paper, no plastic, and all very usable. Note: The current container for this gift has 4 compartments rather than 3, we sold out of the pictured one but can substitute the larger one at the same price. It isn't too much taller.